Next up is Greg Goldberg, returns maven at Harvard Book Store, where he first arrived as a bookseller a little over two years ago. When he’s not playing Grim Reaper and culling the bookstore’s inventory, Greg draws lots of things and reads lots of things. He has vastly and delightfully eclectic taste, so I really didn’t know what to expect from him today, but if there’s one thing I’ve learned from Greg’s recommendations over the years, it’s this: whatever it is, give it a shot. Here he is! The best books are like recreational drugs: they make you see everything little thing at least a little bit differently for at least a little while. The story we’re told about economics and markets turns out to be backwards and misleading, according to David Graeber. Barter did not precede conventional modern market systems, nor did markets precede formal political entities. In fact the exact opposite is true: according to the anthropological evidence, the emergence of coinage coincided with the march and subsequent settling of conquering armies, which suggests that markets as we know them today are descendents of military adventurism. Hardly the apolitical oases of free-choice they’re often thought to be. Graeber is an avowed anarchist, and his perspective is undeniably ideological, but he resists dogmatic pronunciations with a combination of academic rigor and personal connectedness to the subject that few writers of economic history achieve. It came as a revelation to me, personally, that there is no separation between the political and the economic at all, and since this is not the mainstream view, it adds an extra dimension to following the news (if you need one). Anyway, you need to read this book. If you’re interested in anything—money, religion, history, guilt—it will blow your mind. If you have ever wondered or thought about anything—socks, politics, logical syllogism—you should read it. That’s casting a wide enough net, right? Do you watch Netflix? Do you quilt? It doesn’t matter. Please just read this book and tell your friends (and enemies) about it. They’ll thank you. Great! You’ve decided of your own volition to read Debt! Want to support an awesome independent bookstore in the process? Order it through the MIT Press Bookstore, one of the two coolest bookstores in the world. 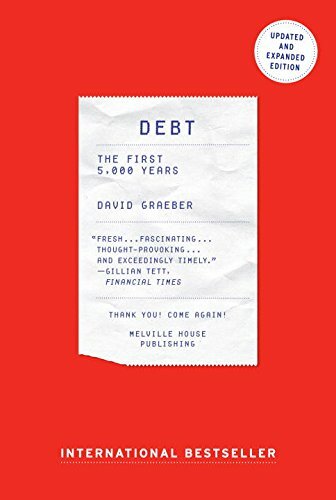 This entry was posted in December 2014 and tagged booksellers, david graeber, debt, debt: the first 5000 years, December 2014, drawing, economics, guest posts, Harvard Book Store, MIT Press Bookstore, nonfiction. Bookmark the permalink.